AvaLAN Wireless Systems, Inc., providers of 900 MHz outdoor long-range industrial wireless ethernet products, has announced the addition of wireless serial (RS-232/ RS-485) solutions. AvaLAN is now offering multiple products to wirelessly connect serial- interfaced devices. 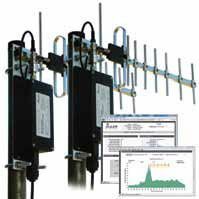 These include an outdoor ruggedized package for RS-232 point-topoint bridging and RS-485 point-to-multipoint interfaced radios operating in the 900 MHz or 2.4 GHz band. AvaLAN also offers serial-interfaced radio modules and evaluation kits for easy integration into customer’s platforms. With over six years of industrial wireless technology development experience and over 30,000 radios shipped to date, AvaLAN has decided to expand into the wireless serial market due to an increased need for connectivity to remote sensors, wireless controls, and remote data collection devices being deployed or currently installed in Smart Grid applications, industrial automation, and others. For more information, visit www.avalanwireless.com. Velocity Microburst, from Microspace, allows Velocity data users to acquire occasional “bursts” of additional bandwidth. Many content delivery requirements call for a weekly or possibly a monthly update of new content to supplement their regularly scheduled delivery. This type of bursty content update is best served by a technology that allows users to increase the data rate of their fixed rate Microspace channel for short, medium, or longer periods of time. Users not only pick the amount of time, but also select the data rate to be utilized during that period of bursty traffic. Microspace Communications has over 20 years of experience in cost effective and reliable point to multipoint delivery of video, audio and data. For more information, visit www.microspace.com. BrightSign has announced today that AVR’s new TheSolution product features the BrightSign HD1010 Interactive digital media player wirelessly controlled by an iPad. The complete bundle also includes a router and an iPad loaded with AVR’s proprietary remote control software. With TheSolution, the iPad multi-touch screen can be used to select, play, pause, resume, and reset videos and graphics on the BrightSign player from virtually anywhere. A key component of TheSolution, the BrightSign HD1010 is a versatile, expandable media player with a very low profile that enables users to tuck it out of sight. The features that have made BrightSign solid-state media players so popular for digital signage applications also make TheSolution ideal for trade show and hotel lobby presentations, corporate meetings, and video kiosk applications. For easy deployment, high reliability, and a low operating cost, BrightSign players have a solid-state, PC-less platform that has no moving parts to fail. With support for a broad range of aspect rations and the ability to co-mingle standard and high-definition media on the same BrightSign player, deployment and use is further simplified. ONELAN’s is showing a new Enterprise Platform that will feature content management, managed workflow, transcoding, and highly targeted content for very large networks. The new platform is designed for productivity and revenue generation at the largest scale and enables brand and advertising networks to generate more revenue while reducing management overhead. Content is scheduled automatically and transformed, scaled, converted, or transcoded into the most suitable format for the target display. Rich Metadata ensures content is automatically scheduled once across multiple SD, HD, LED and web displays. For more information, visit onelan.com. eCAFtech, provider of audience measurement and proactive advertising, has announced the availability of audience measurement solution under wireless transmission network. By integrating the latest wireless transmission technology, this new solution DSVC-200 is expected to generate true viewing data for transportation hubs digital displays and screens by analyzing face images of people watching the displays. eCAFtech’s new Digital Signage Viewer Counter 200 (abbreviated as DSVC-200) is easy to deploy on existing video players and requires a simple webcam; it delivers the key metrics needed to assess the real impact of communication vehicles including the opportunities to see, the number of actual viewers, and their dwell and attention time. No image and no uniquely identifiable data are ever recorded, thus respecting viewer’s privacy. The anonymous audience data are stored on DSVC-200, which allows customers to securely access their audience metrics at any level of detail and over any period of time through USB or FTP device. These days, proving ROI is more critical than ever. Measurement data for DS is needed to support growth of the advertising medium. The validity of DSVC-200 data is key for a true and accurate representation of how your bus or subway screens are performing. eCAFtech DSVC-200 will be the only true wireless audience measurement technology for digital signage! In the near future, large and small retailers, malls, restaurants and bars, transportation hubs, business centers will be examples of venues measured by eCAFtech. For more information, visit www.ecaftech.com.